Of all holidays, Christmas in particular tends to have a polarizing effect on people. Most folks tend to get really excited or really depressed during this time of year. Whether you get really excited about Christmas, really depressed, or somewhere in the middle, I think our reaction is tied in some way to this idea of being in the house of God, being in the presence of the Divine. Our reaction to Christmas is somehow linked to our innate longing to experience relationship with the God we were created to worship. Maybe you’re a person who gets really excited about Christmas – you love the aspect of family gatherings, of giving gifts, of special traditions. My guess is the reason we love these things so much is that in a broken world, these are glimpses that point you toward something that is hardwired into the human heart – a longing to be in the house of God, where all is right. Maybe you’re on the other end of the spectrum – Christmas for whatever reason drains you, makes you depressed, highlights a very personal sense of loneliness. it’s the flip side of the same coin – it points you to the fact that things are not as they should be; there is an unfulfilled longing to be in the house of God, where all is right. Regardless of where you fall on that spectrum, let me say this: we are made for something more than what we experience here on Earth. In every heart is a yearning to be in the house of God – to be united in relationship with our Creator. But in every heart is a tension, a disconnect, some level of frustration because we all know that things are not quite as they should be. There is something about Christmas that highlights this in some way for each of us. The familiar icon of a manger scene reminds us that many people celebrate Christmas as a birthday – the birth of Jesus Christ. Birthdays are special days not because of the day itself, but what that day represents. Your birthday, for example, is not just about a number on a calendar. A birthday represents more than just a day, a moment; it celebrates more than just an event, an occurrence. Birthdays are special because they represent an individual life; a birthday means something because it celebrates a person. This is true for each of us, and infinitely and gloriously true of Jesus. 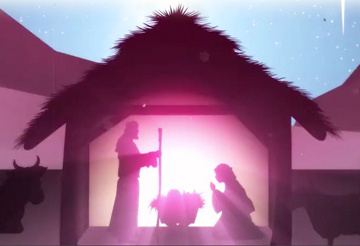 December 25 is a date that holds no lasting value apart from the Person that it celebrates – Jesus. As we experience the longing to be in the house of God and deal with the tension/disconnect that things are not as they ought to be – it is Christ who is the key to fulfilling that basic longing. It is Jesus and Jesus alone who bridges that gap between us and God. So Christmas is not at its core a celebration of a day or a season or a tradition. It is a celebration of a Person: the Person of Jesus Christ, who alone opens the doors to the house of God for us. You and I simply do not have the ability to overcome the gap between our own brokenness and the God we were meant to worship. There could never be enough we could ever become or do or say or give or feel that would make things right between us and a perfect God. This is why Jesus came, and why we celebrate Him above all else. There is no one like Him. He opens the doors to the house of God for us. Christmas is a time that we celebrate something that is true all year long – that God came to earth, born as a humble baby, grew into a man, lived a life we could never live, died a death we could never die to pay a penalty we could never pay. Those who would believe that and trust Him by faith will be able to live and love and worship in the house of God forever, where all is right. Christmas is not just about a day, an event, a singular occurrence. It is about a Person – Jesus Christ. Lord. Savior. Friend. He is both imminent and exalted – Emmanuel – God With Us. This Christmas and in all the days beyond, may we celebrate more than a day, a season, a tradition. May we celebrate the Person of Jesus Christ. There is no one like Him. I’m not sure this is the place to mention this, but I was wondering if sometime Mike would do a sermon or two on why God put us on the earth. I have my own thoughts on why we’re here, but they could be off base. I sure agreed with Mike’s series on why Jesus came. One thing he said on Sunday about the world making sense once he was saved and read the Bible. Those were my exact thoughts.